I'm travelling through Europe this summer by car, and I'm reading up on both german and rules for driving on the Autobahn. 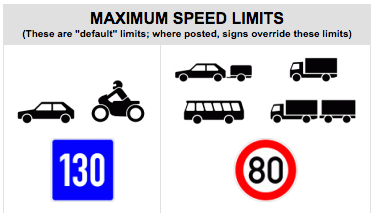 So the first image here has a headline stating "maximum speed limits", but coming from Norway - the look on the signs to me indicate that for motorbikes and cars without trailers, the recommended speed is 130. Does seeing such a sign mean that the recommended pace is 130 km/h, but you are free to go as fast as you please given that the conditions allow it? Here is a slightly different case, but with the same sign. 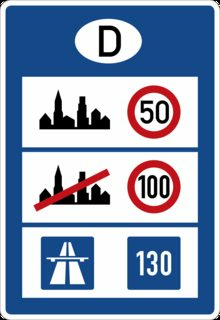 My understand seeing this sign would be 50 km/h limit in urban areas, 100 km/h in suburban areas, and no limit though recommended pace of 130 km/h on the motorway (Autobahn). Okay, let's compile the info for you. First I assume that you are going to travel by car or motorcycle (less than 3.5 tons mass) and are not pulling a trailer. This is the only condition where can even get into a position that no mandatory speed limit applies to you. 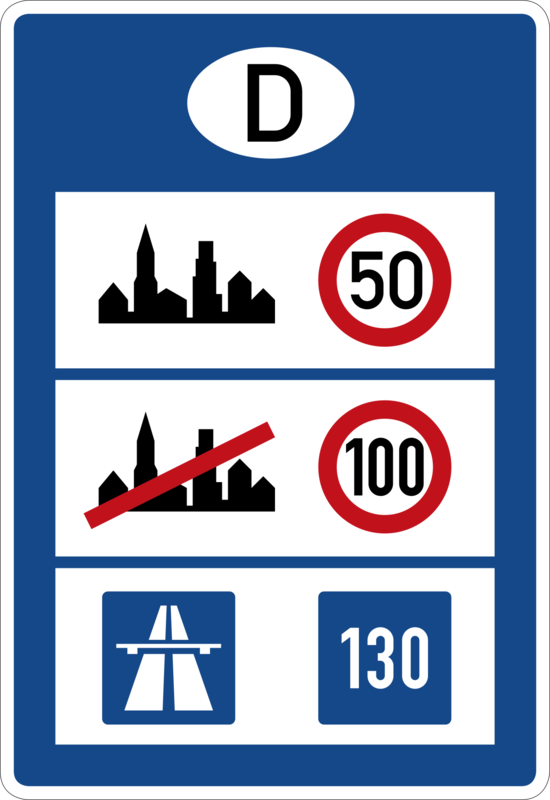 Every other vehicle does have speed limits applied, even on the autobahn (which is denoted the first sign you posted). Then there are mandatory speed limits in Germany. Which is denoted by the second sign. This only depicts the rules for motorcycles and cars below 3.5 tons total mass not pulling trailers. The middle icon depicts exactly that last mentioned sign with the red bar across the city name. 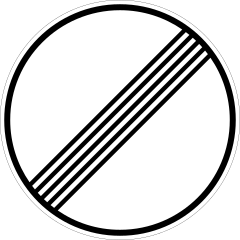 Once you leave an urban area but are not an an Autobahn or Autobahn-like (at least 2 lanes per direction, no intersections, just drive on/off ramps) road, a general mandatory limit of 100 km/h applies. This means as soon as you pass the following sign, the middle restrictions apply. This sign is called "Ende aller Streckenverbote". It just means that the original road limits apply again. For this sign to even appear somewhere, there had to be a limit applied before, meaning you surely had to pass (any) circular red/white sign before that as this sign removes all circular red/white restriction signs, not just speed limits. The number in a blue square indicates an advisory speed limit, which means that exceeding this limit is not a punishable offence by itself, but there is an increased accountability if you are involved in an accident – even if you did not cause it. Wird ein Kraftfahrer, der die Richtgeschwindigkeit von 130 km/h überschritten hat, in einen Unfall verwickelt, so kann er sich, wenn er auf Ersatz des Unfallschadens in Anspruch genommen wird, nicht auf die Unabwendbarkeit des Unfalls i.S. von § 7 Abs. 2 StVG berufen, es sei denn, er weist nach, daß es auch bei einer Geschwindigkeit von 130 km/h zu dem Unfall mit vergleichbar schweren Folgen gekommen wäre. If a motorist who exceeded the advisory speed limit of 130 km/h gets involved in an accident, they cannot – if compensation for damages is claimed from them – invoke the inevitability of the accident as per § 7 Abs. 2 StVG, unless they can prove that the accident would also have happened at a speed of 130 km/h with comparably severe consequences. With other words: If you are involved in an accident when exceeding the advisory speed limit, the burden of proof (that your high speed did not cause damage) is shifted to you. As you already noted, this is the default and you’ll often find explicit signs that take precedence and limit your speed. And of course you cannot ignore circumstances such as the weather. Also be aware that the absence of a speed limit on German highways (autobahn) is a cultural thing (comparable to US weapon laws) and does not mean that driving at very high speeds is a good idea or responsible behaviour, in particular if you have no comparable experience.